Really interesting story from NPR about how siblings are really quite alike in most everything except personality (something most of us with siblings or children have probably noticed). In fact, while the correlations between cognitive ability and physical traits are quite high among siblings, when it comes to personality, siblings are only slightly more likely to share personality traits than random strangers. Certainly true of my sister and I. We get along great, but our personalities are quite different. As for my kids, David and Evan are both really creative and they’re both really shy. Ironically, Alex, who has autism, is definitely the most outgoing (and flirtatious) of the bunch. Unless Sarah is a little more outgoing, though, I’m going to assume that Kim has a dominant shyness gene she’s passing on to everybody. The article covers three interesting theories on why these stark differences: divergence (siblings intentionally choose different paths); environment (e.g., David’s environment will be very different from Sarah’s since he is experiencing our family essentially 11 years sooner and is the oldest rather than youngest of four); and exaggeration (small difference get exaggerated into big ones due to the nature of family dynamics). Best guess here is that it is very likely all three to a considerable degree. I used to think birth order research was a bunch of bunk, but I’m certainly partial to that as part of the explanation. I also think I’ve seen the divergence theory in action many times. Anyway, really interesting topic to think about. If you want to reduce spending, the best way to do it is to raise taxes so that registered voters actually have to pay for the services they get. I don’t have a cute name for this theory, but it’s true nonetheless. Even for Republicans. I think I probably got the idea of “government at a discount” from Chait, but I think it sums up Drum’s point quite nicely in a single phrase. I’m also intrigued by ideas which really seem to make an impact on my students (especially those who have been mislead by the conservative noise machine for years). When this idea of “government at a discount” gets through to them, they tend to look at our tax policy in a much more realistic manner. If only more Americans understood this (again, that’s hard when you’ve got a major political party and its attendant media helpers lying to them on a regular basis). 1) I’m thankful more than three people read this blog. 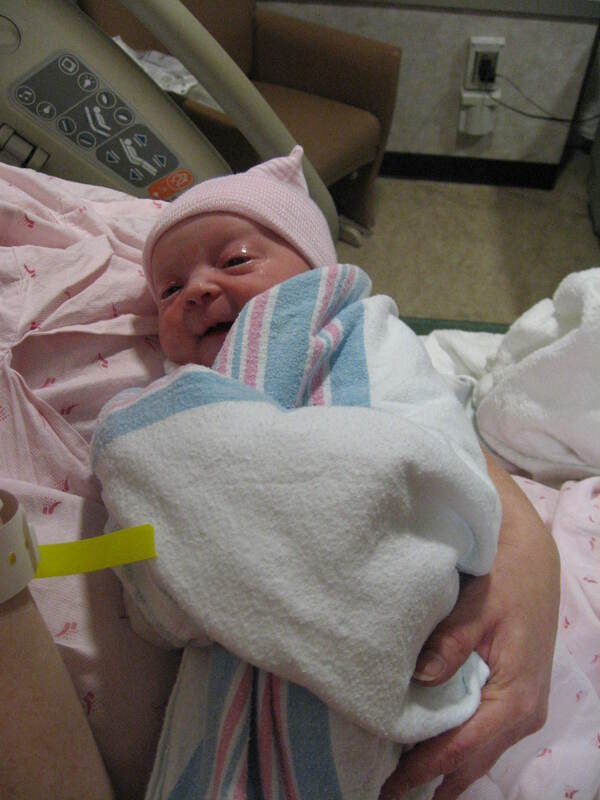 2) I’m thankful that Sarah’s first night at home was a good one. We had one wakeful spell between 3-4, but I had Modern Family and a great 30 for 30 (Marcus Dupree: the Best that Never Was) on the DVR. Otherwise, my lack of breast milk as compared to Kim (or any lactating female for that matter), made things pretty easy. Modest economic recovery and right around 50% sounds about right to me. 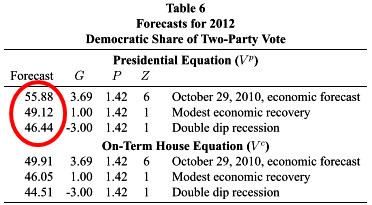 We’ll see, of course, but 2012 could be a very interesting election. As far as looking at the Republican field that will be very important should we see just a modest recovery, Ed Kilgore has a really nice piece in TNR. Among the dark-horse possibilities, Tim Pawlenty is abundantly available, but he’s vulnerable to an early exit if he fails to win in Iowa. (T-Paw is also not exactly a ball of fire.) The fundraising genius Haley Barbour is magic in Washington circles, and seems to want to run, but his background as a lobbyist’s lobbyist is ill-suited to a Tea Party-driven primary season; he would seem certain to follow the path of past GOP candidates John Connolly and Phil Gramm to ignominious defeat in a sea of wasted money. John Thune has reportedly decided against a run already. Mitch Daniels called for a truce in the culture wars, which is a deadly insult to Christian conservatives. Maybe he can flip a coin with fellow Hoosier Mike Pence to see who will try to become known outside Indiana in time for 2012. How can Republicans save themselves? The best way would arguably be for the Republican establishment to coalesce behind a least-bad dark-horse candidate as early as possible in the process. It could be easier this time because 2012 will be the first presidential election after Citizens United, and it might be the first cycle in recent memory where big sacks of shadowy outside money have an impact on the primaries. Yet it’s still a long shot, and whether the ultimate nominee is a dark horse, an insider, or an inflammatory Tea Party favorite like Palin, the nominee will still be hobbled by the demands of the incredibly excited conservative base. Advantage: Barack Obama. 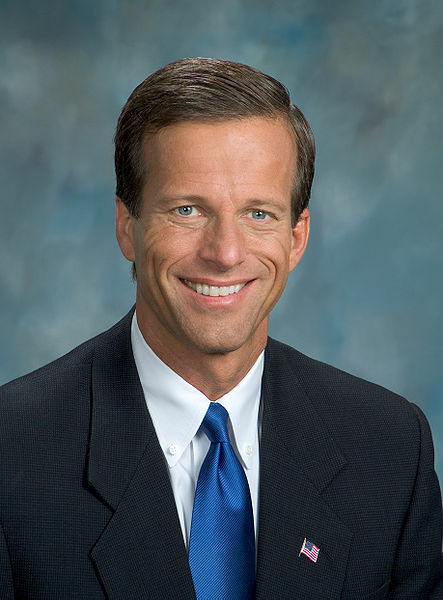 If its true that Thune is out, that strikes me as good news for Obama. I don’t really know much about the guy, but what I do, scares me. Talk about a presidential candidate from central casting. Given that the integrated DVD player in one of my TV’s is broken (a disc seems to be permanantly stuck in there no matter what), I’m looking to by a new DVD player. I’ll probably order one from Amazon. Why, the prices are generally great– and when you figure in the lack of sales tax– really cannot be beat (I also do prefer the convenience and information of shopping on-line). Truth is, of course, that this really is an unfair advantage for Amazon and similar retailers (for example, I almost never order from B&N.com, which has to charge me sales tax because it has stores in NC). As more and more business moves on-line, states are missing out on a significant chunk of revenue that they really need now more than ever. Farhad Manjoo had a really interesting article about this in Slate. The desire to have as few customers as possible pay sales tax has clearly driven Amazon’s business decisions and states are having a tough time fighting back. Here in NC, the request you voluntary report your on-line purchases and pay tax in your state income tax return. My highly ethical wife actually does this (though, I doubt they’re geting the full amount). When you have a tax, you want the base as broad as possible so that the rates can be as low as possible. The exception is when you’re using the tax to discourage something, rather than just raise revenue. But the point of the sales tax isn’t to kill off brick-and-mortar retailers and drive commerce online. It’s to fund state governments. And right now, state governments are losing more than$7 billion a year because online purchases don’t get taxed, and that number is going to keep growing as more and more purchases get done online, in part because they’re exempt from sales taxes. And as they say on the infomercials, that’s not all! This is making an already regressive tax even more regressive. Sales taxes hit low-income residents hardest because they spend a higher percentage of their income. And online purchasing is more common among the affluent than among the cash-strapped. So you’ve got fewer affluent people paying sales taxes, which means more states with big holes in their budgets. And what do states do when they’ve got a big hole in their budget? raise the sales tax, of course. And who’s left paying that increased sales tax? Lower-income consumers, mainly. I certainly like and benefit from this policy (as one of those affluent on-line shoppers). While it may have made sense while internet commerce was in its infancy, now this is clearly just a bad policy (I’m still buying the DVD player at Amazon for now, though). And I’ve got no time to comment, but I think it speaks for itself.